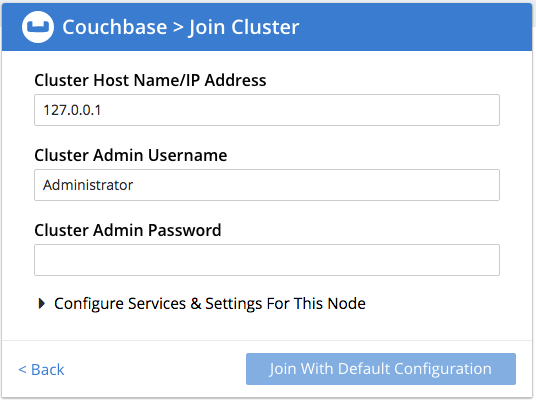 An independent Couchbase Server-node can be joined to an existing cluster. 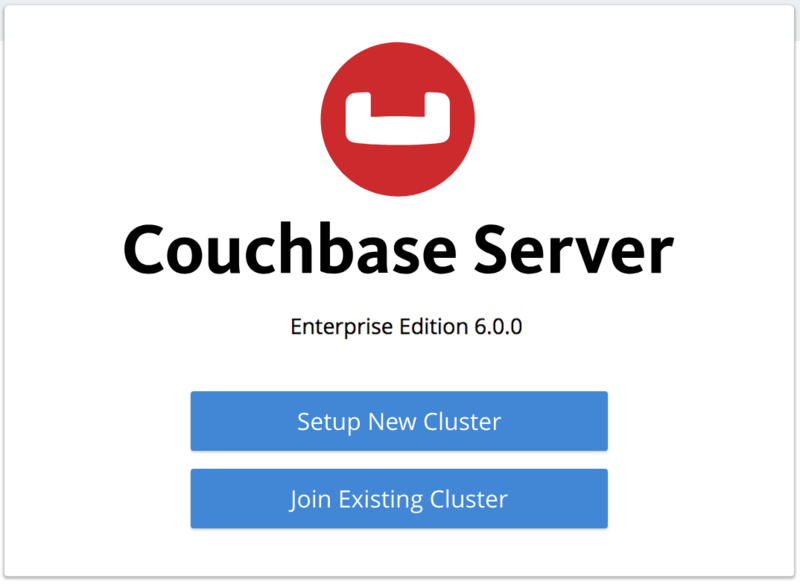 Full and Cluster administrators can use the UI, CLI, or REST API to join a Couchbase Server nodes to an existing cluster. On each node to be added, Couchbase Server must have been installed and started. The process of node-addition grants to the new node the settings already established for the parent cluster. (See Manage Settings for details.) The process allow services to be assigned to the new node. If the new node was previously initialized with custom disk-paths, these are retained (although if the UI is used for the join operation, these paths can be revised). Following node-addition, rebalance is required, to make the new node and active member of the cluster. Note that this process has a similar effect to that described in Add a Node and Rebalance. The difference is that here, the process is inverted: rather than a cluster adding a node to itself, a node is joining itself to a cluster. Note also, however, that a node cannot join itself to a cluster if the node has already been provisioned (that is, has had Full Administrator username and password defined, and may also have had services and memory quotas defined). If the node has been provisioned, the cluster must add the node. The examples in the subsections below show how the same uninitialized and unprovisioned node joins itself to the same existing cluster, using the UI, the UI, and the REST API respectively. No node-join is supported by the CLI. A new node has been started. This is named after its IP address: 10.142.181.101. It has not been initialized or provisioned. The expanded dialog allows specification of the services, the name and IP address, and the disk paths for the new node. It also requires the username and password of the Cluster Admin (although the credentials of the Full Admin for the cluster are equally implied), and the name or IP address of the cluster to be joined. Enter the cluster-name and password, and uncheck all Services fields except Data. Leave all other details unchanged. Then, left-click on the Join With Custom Configuration button, at the lower right. This indicates that the new node, 10.142.181.102 has successfully joined the cluster. However, it is not yet taking traffic, and will be added following a rebalance. Note, at this point, the figure under the Items column for for 10.142.181.101: this is 31.1 K/0, which indicates that the node contains 3.1 K items in active vBuckets, and 0 items in replica vBuckets. Meanwhile, the Items figure for 10.142.181.102 is 0/0, indicating that no items are yet distributed onto that node in either active or replica form. To access information on buckets, vBuckets, and intra-cluster replication, see the Architecture Overview. The hostname and user(-name) and password of the Full Administrator for the cluster to be joined are specified. The service specified to be run on the new node is kv, signifying the Data Server. Note that the knownNodes argument lists each of the nodes in the cluster. If successful, the command returns no output. For further information on joining a cluster with the REST API, see Joining Nodes into Clusters; on rebalancing, see Rebalancing Nodes. 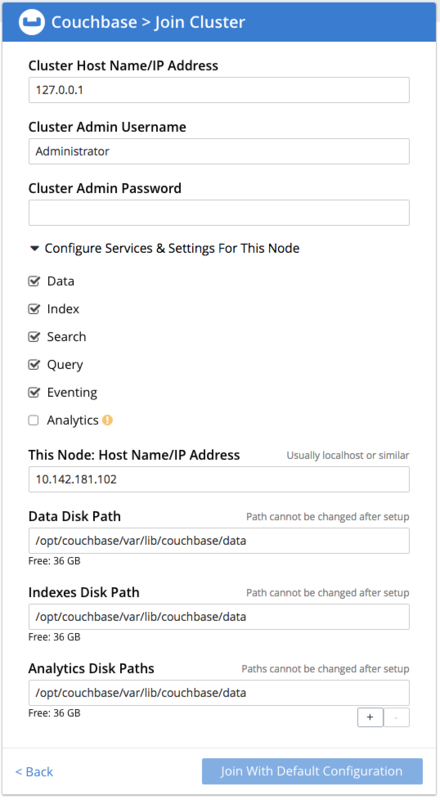 Couchbase Server allows you to list the nodes within a cluster. See List Cluster Nodes for details.